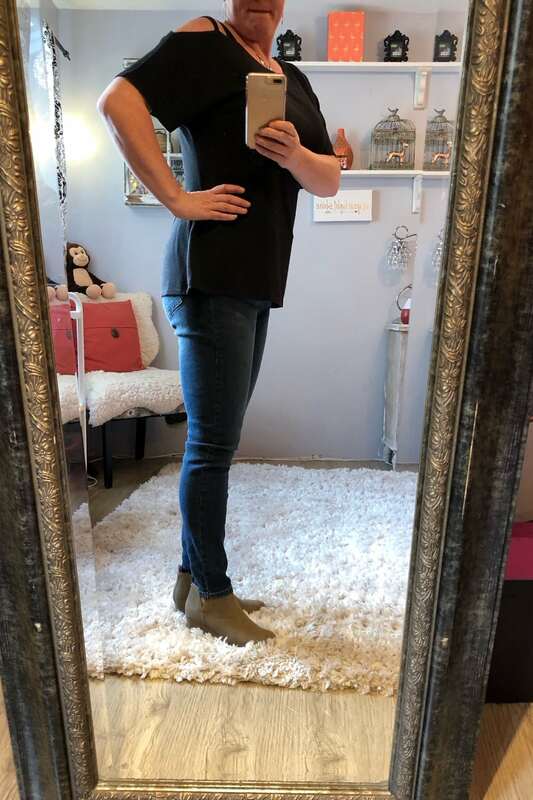 Jen has been getting Stitch Fix subscription boxes for awhile now and she always looks so great in the clothes they pick out for her, that I decided I had to try it too. You can see all of the great Stitch Fix reviews Jen has done here for her family (women’s, men’s and kids reviews)! We also share all of the details on how the Stitch Fix program works in this post too, if you are not familiar with the service. Essentially, you fill out a form letting them know what you like (style wise) and then a stylist picks out items for you, and you decide what you like and want to keep, and then send the rest back. You only pay for what you keep. There is a $20 styling fee, but if you buy anything you can apply that fee towards that purchase. If you are a new customer to Stitch Fix, you can check out using Paypal and get $10 off your styling fee for your first box (this offer should be good through April 6th). Find more details, or sign up for Stitch Fix here. 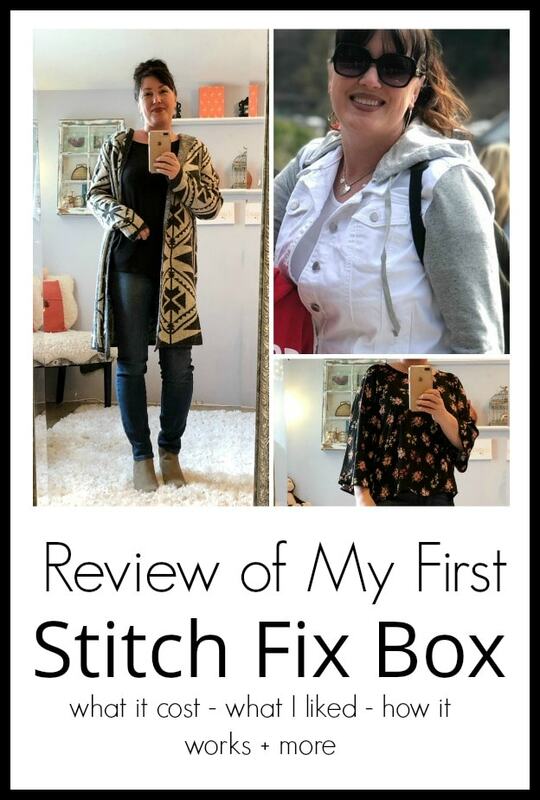 Here is my review of my first Stitch Fix Box. It was a Spring Box (I signed up to get them seasonally, so four times a year). Before I get too far into the review, I have to tell you that I did not grow up in the selfie generation, so taking pictures of myself in a mirror feels completely un-natural to me. For that reason, please do not be too hard on me for the strange faces and awkward poses, I just wanted to show you the cute clothes! I loved this shirt (it was probably my favorite in terms of balance of price and style). It is simple, yet comfortable, and affordable. It is one I would have picked out for myself, so they nailed my style with this one. Now if I can learn to take a picture without squeezing my lips together so tight! 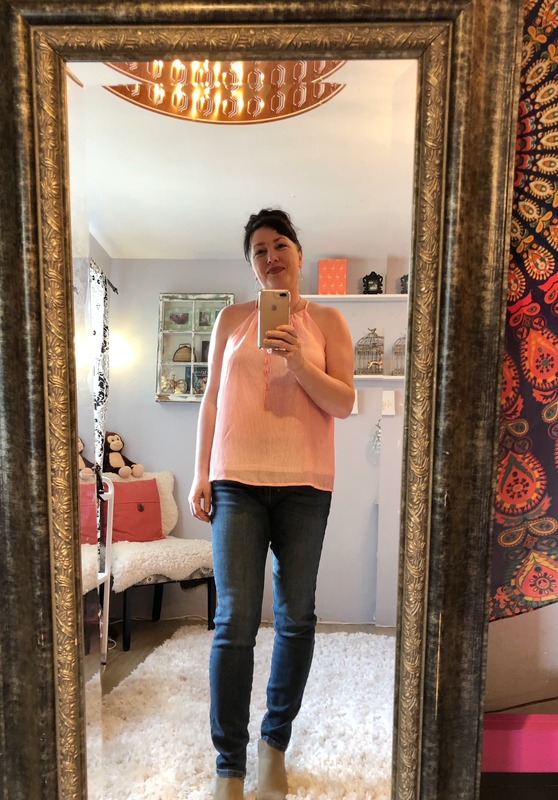 What I liked about the shirt is that it had some style to it, but it was a comfortable knit top that I can throw on with a pair of jeans or leggings. 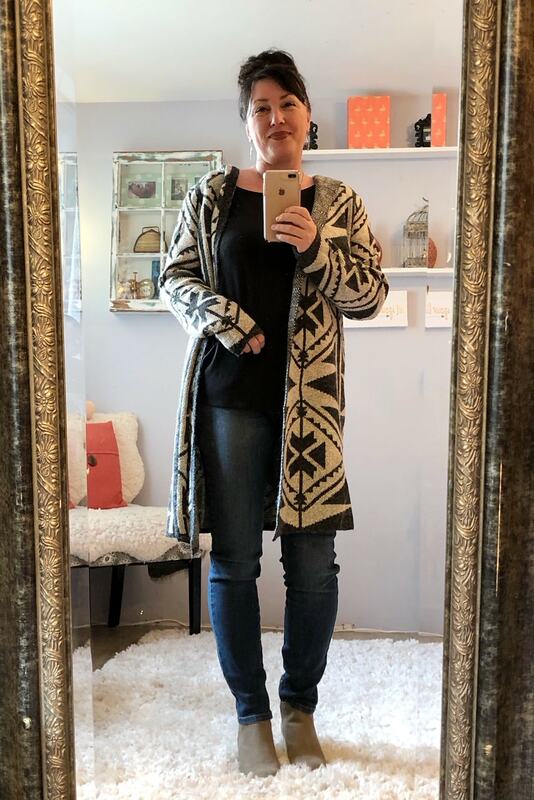 I also loved this long cardigan. I had created a Pinterest board that had many styles like this, so I was really glad to see something similar come in my box. It was pricier then I would normally spend on myself, but it did cause me to push myself a little in what I am willing to spend on me. I have worn it out a few times, and always get compliments on it, so I am glad to have added this to my wardrobe! Plus, it is cozy, and I love being able to wrap up in something that feels cute too. This mixed white and grey jacket is definitely spendier then I would ever think of buying in the stores. I almost put it back, just based on the price, but I wore it around the house for a bit (since it was so comfortable) and fell in love with it. It is a great transition coat from Winter to Spring in the Northwest. I am not sure I would have even tried it on in the store , but I really did end up loving it once I did try it on at home. 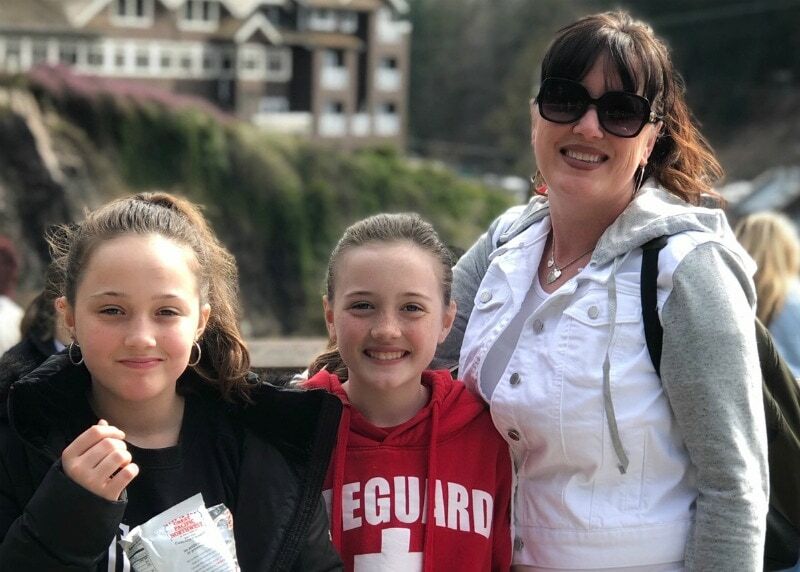 My girls and I took a day trip up to Snoqualmie Falls and this jacket was light enough to enjoy a beautiful NW Spring day in, yet kept me warm and comfortable all day. I was really glad I kept this one. This shirt is one I had in the bag to send back, and pulled out at the last minute, and boy am I glad that I did! It was on the more affordable side in terms of what came in this box, and I liked it but was not sure I loved it, so initially I had it in the send back box. I kept thinking about how light and comfortable it was, and how I loved the feminine details on it, so I pulled it back out before sending the bag back. I am glad I did, as I have probably worn this shirt more than any of the items after all. It packs really well (no wrinkles) and can be dressed up or down, and is very comfortable. It is light enough to keep me cool, but covers enough to wear it where ever! I really liked the color, and light weight fabric of this top, but it is just a style I do not wear much of. I don’t have a bra that I can easily wear with it, and was just unsure of how much wear I would actually get. The price was a deciding factor for me, so I sent this one back. The jeans shown in all the pictures above are the high rise skinny jeans I got in my Stitch Fix box. I was really hoping for a pair I would love, but these were not it. I did love that they were high rise, and the zip detail at the bottom, but the fit was just off for me. They met all the details I specified to the stylist, but I am between sizes and there were just too many places these jeans gaped for me to keep, and did not have a smooth fit. I am hoping for a better jean option in the next box! These are the boots, and I loved them, but I did end up sending them back. I sent them back not because I did not like the style and fit but because they were $84 and it was Spring (I plan to wear fewer booties now through Summer) and I do have a pair of booties close in color to these already. So all in all, I kept about half the box and sent about half back. This was my first box, so I think they sent me more then usual to start to gauge my style. I would love to be able to take advantage of the extra 25% off savings, but you have to want everything in the box to do that, and I was not there just yet with this box. I LOVE the looks Sia! I’d say they nailed your style! You look beautiful! Hi Shari, great to hear from you and thanks. Your so kinds (and you are looking wonderful as always!). Hope all is well with you!